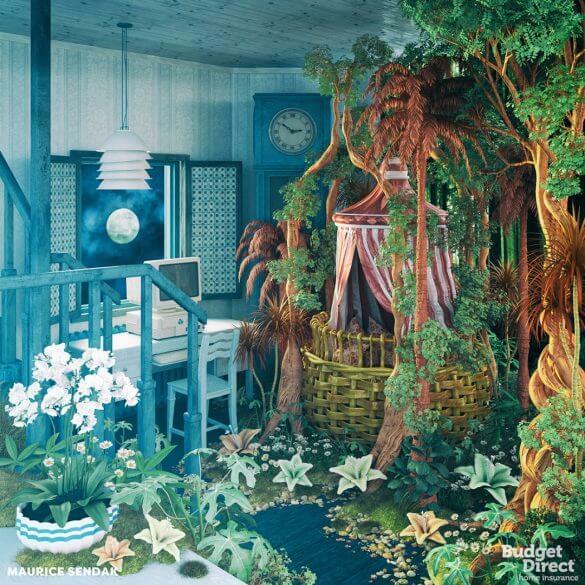 Budget Direct have recently asked: what if nursery designs were as memorable as your baby’s arrival itself? 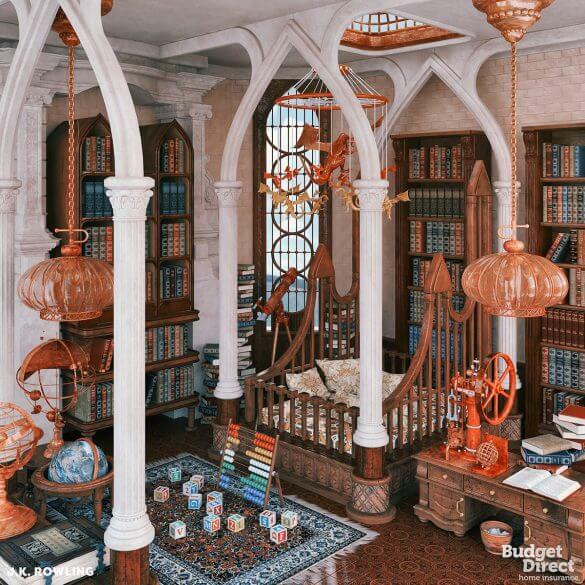 What if these childhood rooms were inspired by the children's books that you loved when you were growing up? In answer to these questions, the company has created six inspiring, fantastical nurseries, designed to represent some of the world’s favourite childhood stories. Instead of solely the gender of the baby, they hope to use these designs to show the importance of creating a nursery based on imagination. 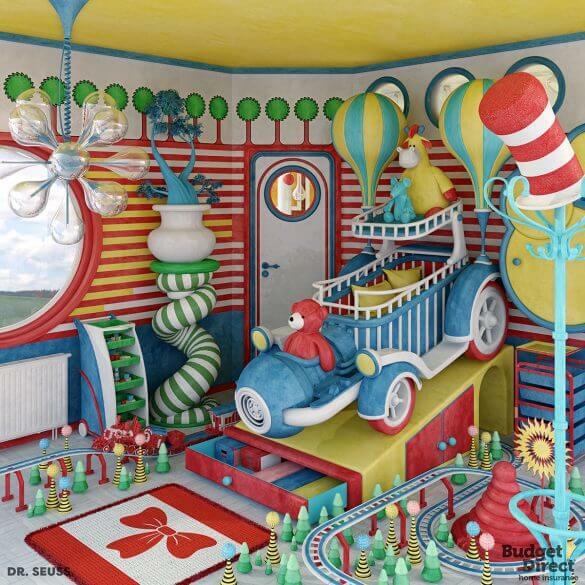 The first of our nursery designs is a room inspired by well-known children’s author Dr Seuss. Famously known for authoring over sixty children’s books, this nursery could be the inside of this acclaimed author’s mind. The nursery features a large blue, white and red curvy crib and a pastel dresser for the baby’s clothes and accessories. The main colours and illustrations around the room take inspiration from Dr Seuss classics including The Cat in the Hat and Green Eggs and Ham. This admirable design style would create a vibrant, dreamlike room for any little one, filled with imagination – and plenty of room for doodling. This nursery has a truly eye-catching design. The design is based on American designer, writer and illustrator of children’s books, Eric Carle – who is best known for the tale that has stood the test of time: The Very Hungry Caterpillar. The bold colours that we see in The Very Hungry Caterpillar make up the base of the room, in front of e simple white walls. The total effect is a mesmerising combination of reality and imagination. Using lively colours and floral elements, the room allows for all types of cuddly animal companions. Meanwhile, the rugged texture of a weathered look could compliment any shabby-chic furniture. 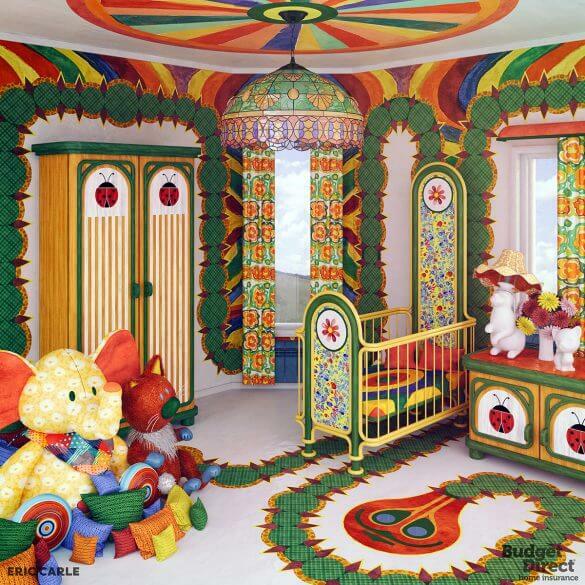 It is time for monsters to get out from “under the bed”, as proven in this next nursery design. Instead, monsters should be “out in the open” - especially when they are based on furry, big-eyed, friendly kind such as those in Maurice Sendak’s famous book, Where the Wild Things Are. This nursery avoids the colour scheme of previous designs, instead opting for more subtle shades and early tones to create a warm earthy feel. The main focus of this design are the century-old prints of nature that surround the baby’s crib. Meanwhile, the computer by the window and the clock against the wall maintains the rooms connection to modernity. Although Lewis Carrol was predominately a mathematician and inventor, he was also famous for creating some of the most significant characters in children’s literature. 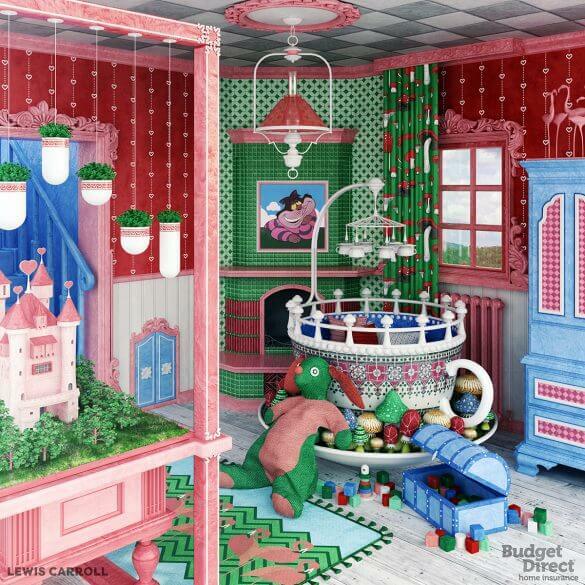 His classic tales Alice in Wonderland and Through the Looking Glass demonstrates his unique creativity; characters such as the Queen of Hearts, the Mad Hatter and the Cheshire Cat may have occupied Wonderland, but they also fit flawlessly in this nursery design. The pink ‘heart’ wallpaper and other rosy elements incorporates the Queen of Hearts –without showing her mean streak. On the other hand, the little door and the additional splashes of blue around the room refer to Alice. Naming the nursery “The Rabbit Hole” and hanging a mobile above the baby’s crib with the Cheshire Cat’s floating smile seems almost essential to complete the look. Arguably one of the most famous children's authors in the world, J.K Rowling needs no introduction. The astonishing design in this room transforms the space into a piece of the antique, mysterious castle that is Hogwarts. It might be one of the more complicated designs to pull off, but the end product is truly worth it. Large, curved pillars are used as the basis of the grand crib, with 3-D wallpaper making the giant bookshelves to come to life. Additional books around the room add to the design, making it look more like the Hogwarts library. The colour scheme of this design is very important, with browns, coppers, greens and burgundies giving the space a traditional, long-established feel. A prolific writer of plays travelogues, novels and poems, h Hans Christian Andersen was best known for his fairy tales. As a result, there are almost too many themes to chose from when it comes to designing a nursery – but the themes remain: representing the importance of love, virtue, and innocence. Perhaps the nursery could be based on The Ugly Duckling with a bright, farmyard scene. Alternatively, create a kingdom under the sea based on The Little Mermaid, with sparkling greens and blues. 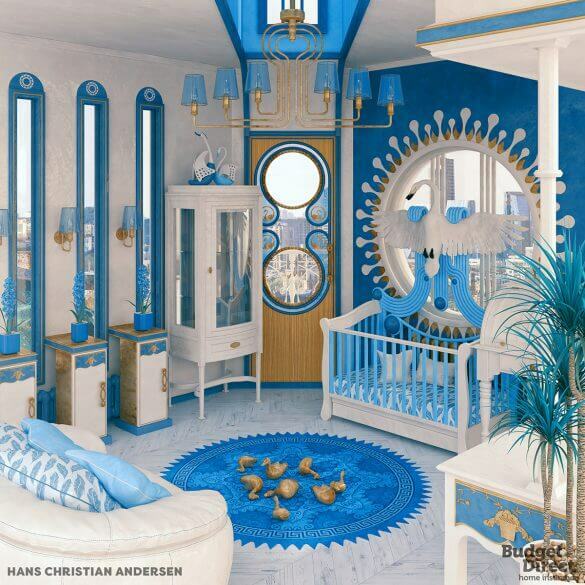 If you’d rather go down a more sophisticated route, choose colours from the wintry world of The Snow Queen – or, like in this charming nursery, choose a mixture of Hans Christian Andersen’s most famous works.